Identiv’s RFID Labels are blank, printed, or transparent radio frequency identification stickers for metallic or non-metallic surfaces. Make them your own.If you’re looking for customization, you came to the right place. Our RFID Labels can be graphically branded, custom encoded, multi-frequency tuned, and domed for enhanced protection. Have a special effect in mind? We can probably do that, too. 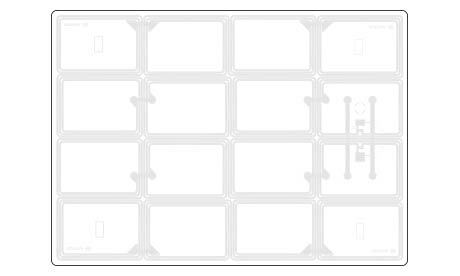 Combined with Identiv’s radio frequency identification (RFID) inlay portfolio, our RFID Labels are available in a huge range of sizes, can be rectangular, square, or even round, and can support ISO/IEC 15693, ISO/IEC 14443, ISO/IEC18000-3, or ISO18006-C EPC Gen2, including NFC Type 1, 2, 3, and 4. How’s that for options? Plus, these adhesive transponders are available with all major chips, including NXP, Infineon, Inside Secure, ST Microelectronics, Broadcom, EM Microelectronics, Alien Technology, Impinj, Sony Felica, and more. Identiv’s new family of labels leverages NXP® NTAG® 424 DNA chips, strengthening Identiv’s RFID offerings that provide security for the Internet of Things (IoT). The tags are designed for anti-counterfeiting for brand protection, document authentication, secure supply chain traceability (i.e., product origin and provenance), authorized data access, and trusted customer engagement, including loyalty programs. 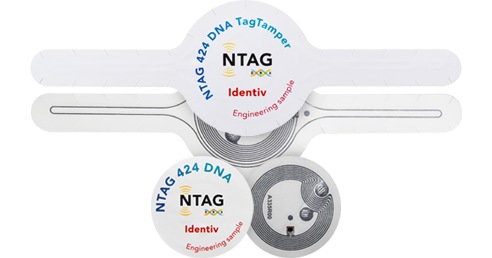 The Tamper Detection NTAG 424 DNA Tag version (utilizing NXP’s TagTamper chip) just received certification proving full conformance with NFC Forum specifications, making Identiv the first transponder manufacturer to receive NFC Forum accreditation. 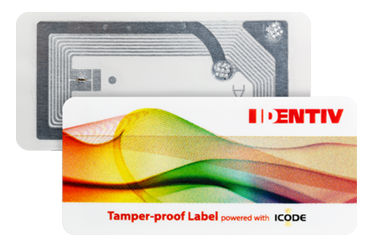 Identiv’s Tamper-Proof RFID Labels integrate state-of-the-art aluminum-etched antennas and an innovative, tamper-proof release coating. Standard RFID tags are not designed for metal. 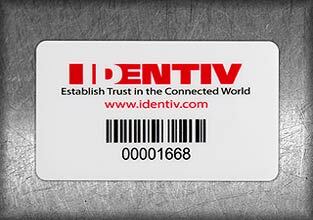 The technology behind our RFID Tag on Metal (TOM®) Labels is unique. These high frequency (HF) labels (ISO/IEC 14443 or 15693) are equipped with a shielding technology that provides an optimum read range when applied to metallic surfaces. Identiv’s Giant NFC Transponder is a breakthrough solution, delivering consistent signal detection over the entire surface area by any near field communication (NFC) enabled device through enhanced antennas. Connect as many labels as needed to cover a large advertising display, panel, poster, or wall, and every point will be completely interactive. Working together, an assistive technology company and Identiv are aiming to use RFID labels to save lives and keep patients safe, one prescription at a time.